At the end of a tumultuous court session, High Court justices ruled Tuesday that any parent of school children in Emmanuel who does not abide by the court ruling to end discrimination based on community affiliation will be jailed on Thursday for two weeks. The justices wrote in their ruling that the parents violated the previous edict that made it clear that separating between Ashkenazi and Sephardic study tracks is ethnically, and not religiously, motivated. They also ruled that should the parent not obey the court ruling by Wednesday, he will be imprisoned for two weeks and that the State will take the necessary action to collect the fines imposed thus far on the school and the parents. The judges also ordered that a copy of the ruling be brought before the attorney general. They made it clear that their ruling in no way intended to thwart the State from continuing any and all measures at its lawful disposal to prevent discrimination. The judges wrote, "It is our hope that the same harsh measures will not be necessary in Israel as were needed in the US in order to enforce the law that nullified the education doctrine of 'separate but equal.'" 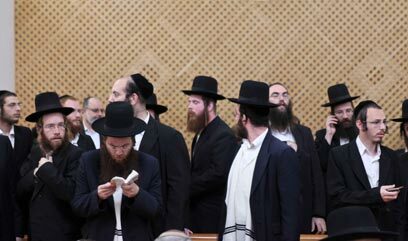 Sources in the Slonim Hasidic dynasty said that the parents would likely reject the High Court's demand and were willing to go to jail. According to the sources, dynasty's leaders have clarified that the entire affair is a "religious war and a case of persecution". According to a senior element in the Hasidic dynasty, "the greatest sages of Israel" will accompany the 50 parents to prison. He added that "this is the start of a great war on the Jewish character. If anyone has any sense, they will solve this crisis now. We will not give up, as this is about the education of our children and the apple of our eye. "We view this as religious persecution in the Land of Israel, when the court decides where we should send our children to study, although we are willing to leave the city and study somewhere else," he concluded. Hours before the dramatic ruling was issued, the parents tried to convey tranquility despite the harrowing situation. A representative of the parents, Yitzhak Weinberg, told Ynet, "We have no idea what will be. We are cautiously optimistic, but with cautionary pessimism. There are layers saying that we are heading for arrest, and there are those who are saying that the High Court will not intervene in the education of our children. We may be sent to prison. This is a reasonable possibility from my perspective." Over the past weeks, bids were made to reach a compromise. Many contributed to this effort to reach a suitable conclusion. Chief Rabbi Shlomo Amar intervened a week ago at the behest of Emmanuel Chief Rabbi Gershi Ezra. Two rabbis from the National Religious stream also tried their hands in the mediation efforts. At the beginning of the week, Rabbi Dov Lior and Rabbi David Davidkovich met with Rabbi Yakov Yosef in order to arrange a meeting between him and the head rabbi of the Slonim Hasidic dynasty, but neither of them succeeded in advancing the issue in any significant way. See all talkbacks "Court to Emmanuel parents: Obey ruling or go to jail"